The demo application can be accessed on (http://ngAuthenticationWeb.azurewebsites.net). 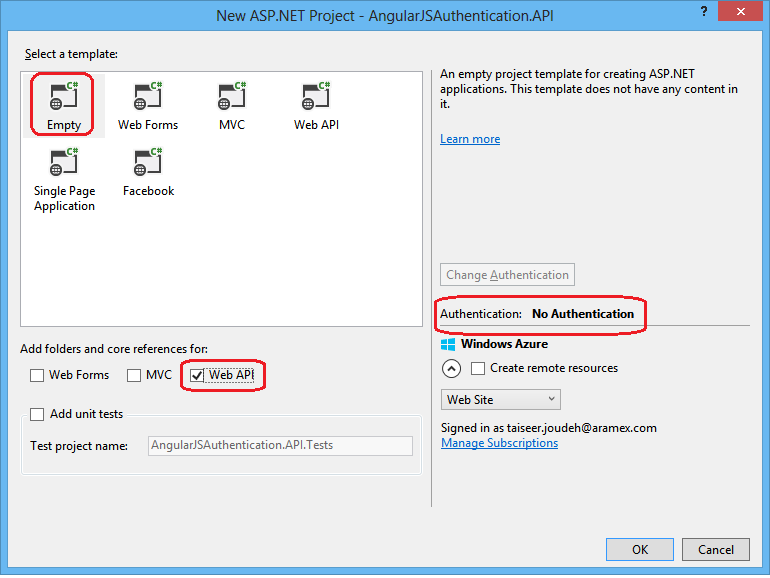 The back-end API can be accessed on (http://ngAuthenticationAPI.azurewebsites.net/) and both are hosted on Microsoft Azure, for learning purposes feel free to integrate and play with the back-end API with your front-end application. The API supports CORS and accepts HTTP calls from any origin. You can check the source code for this tutorial on Github. As I stated before we’ll use token based approach to implement authentication between the front-end application and the back-end API, as we all know the common and old way to implement authentication is the cookie-based approach were the cookie is sent with each request from the client to the server, and on the server it is used to identify the authenticated user. Scalability of Servers: The token sent to the server is self contained which holds all the user information needed for authentication, so adding more servers to your web farm is an easy task, there is no dependent on shared session stores. Loosely Coupling: Your front-end application is not coupled with specific authentication mechanism, the token is generated from the server and your API is built in a way to understand this token and do the authentication. Mobile Friendly: Cookies and browsers like each other, but storing cookies on native platforms (Android, iOS, Windows Phone) is not a trivial task, having standard way to authenticate users will simplify our life if we decided to consume the back-end API from native applications. The front-end SPA will be built using HTML5, AngularJS, and Twitter Bootstrap. The back-end server will be built using ASP.NET Web API 2 on top of Owin middleware not directly on top of ASP.NET; the reason for doing so that we’ll configure the server to issue OAuth bearer token authentication using Owin middleware too, so setting up everything on the same pipeline is better approach. In addition to this we’ll use ASP.NET Identity system which is built on top of Owin middleware and we’ll use it to register new users and validate their credentials before generating the tokens. 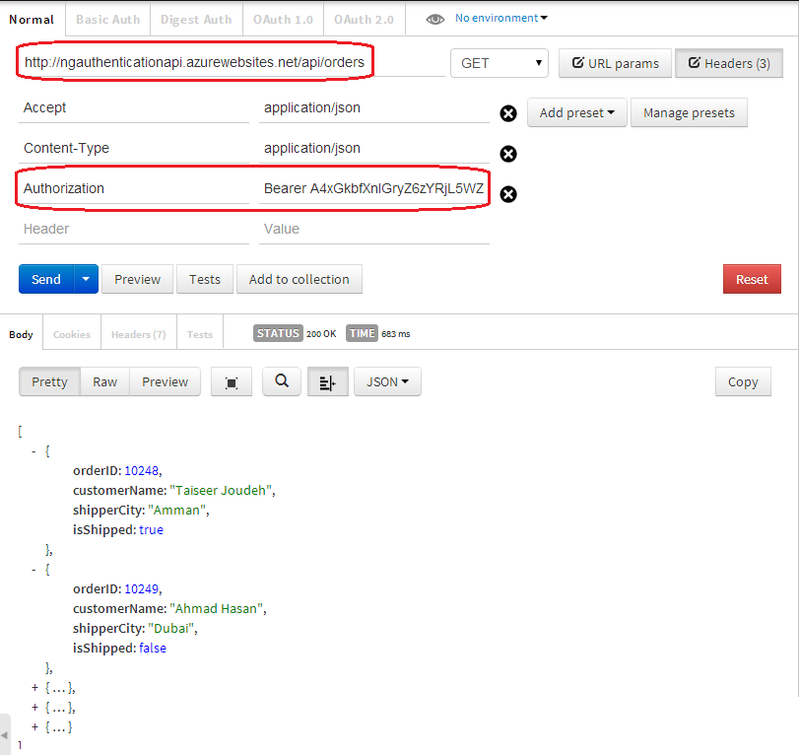 As I mentioned before our back-end API should accept request coming from any origin, not only our front-end, so we’ll be enabling CORS (Cross Origin Resource Sharing) in Web API as well for the OAuth bearer token provider. Allow users to signup (register) by providing username and password then store credentials in secure medium. Prevent anonymous users from viewing secured data or secured pages (views). Once the user is logged in successfully, the system should not ask for credentials or re-authentication for the next 24 hours 30 minutes because we are using refresh tokens. So in this post we’ll cover step by step how to build the back-end API, and on the next post we’ll cover how we’ll build and integrate the SPA with the API. Enough theories let’s get our hands dirty and start implementing the API! As you can see this class inherits from “IdentityDbContext” class, you can think about this class as special version of the traditional “DbContext” Class, it will provide all of the Entity Framework code-first mapping and DbSet properties needed to manage the identity tables in SQL Server. You can read more about this class on Scott Allen Blog. What we’ve implemented above is the following: we are depending on the “UserManager” that provides the domain logic for working with user information. The “UserManager” knows when to hash a password, how and when to validate a user, and how to manage claims. You can read more about ASP.NET Identity System. Now you can run your application and issue HTTP POST request to your local URI: “http://localhost:port/api/account/register” or you can try the published API using this end point: http://ngauthenticationapi.azurewebsites.net/api/account/register if all went fine you will receive HTTP status code 200 and the database specified in connection string will be created automatically and the user will be inserted into table “dbo.AspNetUsers”. Note: It is very important to send this POST request over HTTPS so the sensitive information get encrypted between the client and the server. The “GetErrorResult” method is just a helper method which is used to validate the “UserModel” and return the correct HTTP status code if the input data is invalid. The path for generating tokens will be as :”http://localhost:port/token”. We’ll see how we will issue HTTP POST request to generate token in the next steps. We’ve specified the expiry for token to be 24 hours, so if the user tried to use the same token for authentication after 24 hours from the issue time, his request will be rejected and HTTP status code 401 is returned. We’ve specified the implementation on how to validate the credentials for users asking for tokens in custom class named “SimpleAuthorizationServerProvider”. Now we passed this options to the extension method “UseOAuthAuthorizationServer” so we’ll add the authentication middleware to the pipeline. As you notice this class inherits from class “OAuthAuthorizationServerProvider”, we’ve overridden two methods “ValidateClientAuthentication” and “GrantResourceOwnerCredentials”. The first method is responsible for validating the “Client”, in our case we have only one client so we’ll always return that its validated successfully. The second method “GrantResourceOwnerCredentials” is responsible to validate the username and password sent to the authorization server’s token endpoint, so we’ll use the “AuthRepository” class we created earlier and call the method “FindUser” to check if the username and password are valid. If the credentials are valid we’ll create “ClaimsIdentity” class and pass the authentication type to it, in our case “bearer token”, then we’ll add two claims (“sub”,”role”) and those will be included in the signed token. You can add different claims here but the token size will increase for sure. Now generating the token happens behind the scenes when we call “context.Validated(identity)”. To allow CORS on the token middleware provider we need to add the header “Access-Control-Allow-Origin” to Owin context, if you forget this, generating the token will fail when you try to call it from your browser. Not that this allows CORS for token middleware provider not for ASP.NET Web API which we’ll add on the next step. 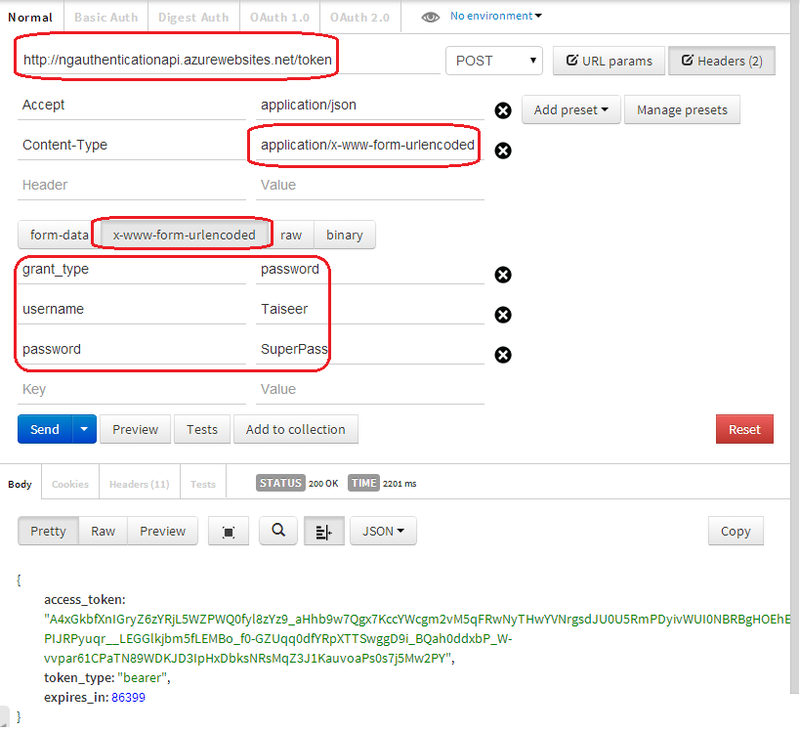 Notice that the content-type and payload type is “x-www-form-urlencoded” so the payload body will be on form (grant_type=password&username=”Taiseer”&password=”SuperPass”). If all is correct you’ll notice that we’ve received signed token on the response. As well the “grant_type” Indicates the type of grant being presented in exchange for an access token, in our case it is password. Now we want to use this token to request the secure data using the end point http://ngauthenticationapi.azurewebsites.net/api/orders so we’ll issue GET request to the end point and will pass the bearer token in the Authorization header, so for any secure end point we’ve to pass this bearer token along with each request to authenticate the user. Note: that we are not transferring the username/password as the case of Basic authentication. If all is correct we’ll receive HTTP status 200 along with the secured data in the response body, if you try to change any character with signed token you directly receive HTTP status code 401 unauthorized. Now our back-end API is ready to be consumed from any front end application or native mobile app. 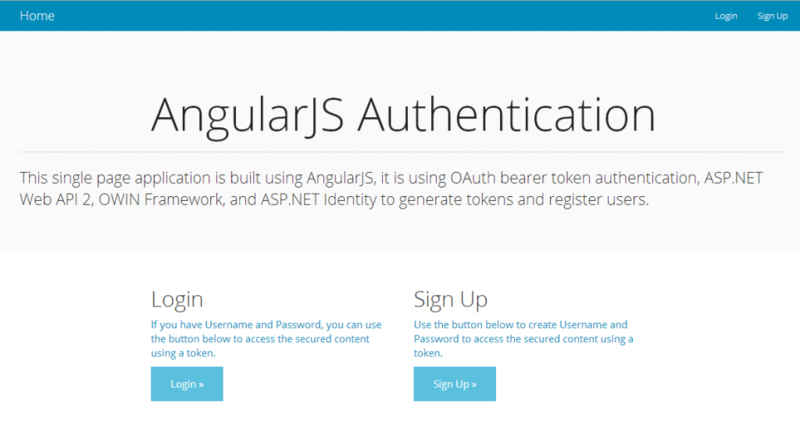 This entry was posted in Angularjs, web api and tagged angularjs, WEB API on October 29, 2015 by Gurjeet.